More than three months after a new Constituent Assembly was elected, Nepal’s second attempt to write a new constitution is only just beginning to take its first steps. Few had expected that the process would begin quickly and smoothly, and the general public is still by and large buoyant and hopeful following November’s remarkably free and fair elections. But the early signs are, if not worrying, then certainly frustrating and do not bode well for the delivery of a constitution within a year. With the Maoists vanquished at the November polls, power returned to the Nepali Congress and the Communist Party of Nepal (Unified Marxist Leninist), the country’s largest parties who have held the majority of the power during Nepal’s democratic interludes. 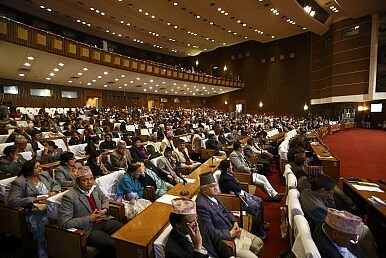 Proceedings in the Assembly were, however, threatened as soon as the election results were announced, as the third-placed Maoists claimed that voting had been rigged by foreign agencies and the Nepal Army in favor of the victors, and the congratulatory mood of much of November was punctuated by vague threats of “remobilizing” the people from the more hardline elements of the Maoist spectrum. However, in what many will take to be a sign of their increased political maturity, the Maoist leadership seems to have accepted its electoral defeat and has committed to sitting in opposition in the new government. Chairman Pushpa Kamal Dahal and chief ideologue Baburam Bhattarai have admitted that the party leadership now must regain the trust of the public and its extensive networks of grassroots activists and cadres after several unproductive years in power, during which its leaders showed themselves as susceptible to corruption and incompetence as any. With the Maoist leaders busy blaming each other for the November disaster, the familiar bedfellows of the Nepali Congress and UML were left to sort out a power-sharing arrangement. A verbal gentlemen’s agreement was made between the two parties, which the UML claimed would see the influential Home Ministry and the post of Deputy Prime Minister go to their party in return for supporting Nepali Congress President Koirala’s bid for Prime Minister. Koirala was elected prime minister by the assembly on February 10, and duly turned his back on the UML. Claiming that writing the constitution was his foremost task, with or without a consensus government, Koirala remained stubborn and announced plans to form a cabinet from within his own party if the UML refused to come to the table. The UML boycotted the swearing-in ceremony and for the next two weeks remained outside government. Koirala, with a cabinet consisting of just one minister (without portfolio), and increasingly isolated from other leaders within his own party, began to contemplate an alliance with the Maoists and Kamal Thapa’s royalist Rashtriya Prajatantra Party (Nepal), a coalition even less workable than with the now wary UML. However, pressure from within Koirala’s own party, most notably from high ranking leader Sher Bahadur Deuba (whom Koirala had only narrowly defeated in a leadership contest in January) forced Koirala to accede to the UML’s demands, and a full cabinet was finally formed on February 24. Despite promises of inclusion and broadening participation among Nepal’s many ethnic and linguistic minorities during the run-up to the elections, the dominance of the male, high caste elite remains: out of the nineteen ministers who have been sworn in, only two are women, only two are from the hugely underrepresented southern plains and there are none at all from the impoverished far west of the country. Away from the brouhaha of the constitution writing process so far, informal talks between the heads of the two factions of the Maoists, Pushpa Kamal Dahal and Mohan Baidya are ongoing, opening the door for a possible reunification, according to the political magazine Samayabodh. The elections have made clear the extent of the public’s discontent with both factions – Baidya’s, which boycotted the elections and was widely ridiculed as a consequence, and Dahal’s, which competed and fared badly. Both groups are now doing some serious rethinking and attempting to reconnect with their disaffected grassroots in preparation for the upcoming local elections. After his succession as prime minister in 2008, Maoist chairman Pushpa Kamal Dahal sparked much speculation and worry among Nepal-watchers in India when he broke with tradition and visited Beijing before New Delhi. Koirala’s relationship with New Delhi has also been far from cordial. He was interred in the city’s notorious Tihar prison for his suspected role in the hijacking of a Royal Nepal Airline plane in the early 1970s by Nepali Congress cadres who were conducting an armed campaign against the monarchy in Nepal. His first scheduled foreign visit, to Myanmar to attend the third summit of the Bay of Bengal Initiative for Multi-Sectoral Technical and Economic Cooperation, will have sent a less antagonistic message to New Delhi than Dahal’s China visit, and Koirala and Indian Prime Minister Manmohan Singh did meet briefly at the sidelines of the summit. Cooperation over Nepal’s huge potential for hydroelectric power production (India has the money to finance such projects as well as an economy in need of power) remains minimal and often informed by unproductive nationalist rhetoric from Kathmandu, which Koirala would do well to avoid. Privately thankful that the Maoists are not in government and yet have (for the moment) committed themselves to the political process, India has assured its continuing support for the constitution writing process. Nepal’s dependence on its southern neighbor both as a trading partner and a workplace for many Nepalis mean that the Indian ambassador to Kathmandu is an important factor in India-Nepal relations. The current ambassador Ranjit Ray, a long term Nepal specialist who helped draft the twelve point agreement which bought the Maoists and political parties together in 2005 and led to their ousting of the monarchy and ending the civil war, has so far managed to maintain good relations with Kathmandu’s politicians and civil servants. In a recent interview with the leading daily Kantipur, Ray reiterated India’s desire to see a peaceful and prosperous Nepal and emphasized the importance he gave to continuation of the open border policy between the two countries in facilitating trade, development and maintaining close social and cultural ties. The newly appointed members of the Constituent Assembly have set themselves an extremely busy agenda, one which will leave little time to fulfill their mandated task of writing the constitution if the intra- and inter-party fractures are not patched up. Local elections are due to be held in the coming months and will provide a clue as to the intentions of both Maoist factions: whether a revitalized grassroots will be deployed to take part in the electoral process or to disrupt it is a question many will be concerned with. Inside the Assembly, Koirala’s leadership is likely to be hampered by the Deuba faction within the Nepali Congress, who already hold four of the ten ministerial posts allocated to the party and have been open in their dissatisfaction with aspects of Koirala’s leadership to date. How a federal Nepal will look is also an issue on which meaningful consensus is yet to be reached. The manifestoes of the Congress and the UML were both vague enough on what form of federalism they plan to enact to address the longstanding grievances of those excluded by the Kathmandu elites, that friction and resistance are likely to dominate the discussions from the outset. The nascent transitional justice process has also been a victim of the political deadlock. A report released in January by the Nepal Advocacy Forum pleaded for the establishment of a legal and policy framework for vetting and amnesty, a task still unaccomplished despite the fact that almost eight years have elapsed since the cessation of hostilities. Nepalis voted in large numbers last November, with close to 80 percent turnout in some districts. However, the public has become sadly used to their politicians failing to keep promises and work sincerely for the common good. For much of the 1990s, government was dominated by the Nepali Congress and the UML, and their collective failure to address the grievances and demands of much of the population provided space for the Maoist insurgency to spread and evolve into the greatest challenge the Nepali state has faced in its history, and a hugely destructive upheaval that Nepali society is only just beginning to come to terms with. The constitution will ultimately signify the beginning of the political aspect of this process. Unfortunately, it remains to be seen whether those in the Assembly today can learn from these lessons, forget for the moment factional squabbles and self interest, and work towards fulfilling the task they have been elected for. Ross Adkin is a writer based in Kathmandu. Why India and China Are Watching Nepal's ElectionsCan Nepal Find Political Stability?Nepal's Trial-By-ElectionNepal: Elections at the EpicenterAre the Maoists Rising Again in Nepal?